Baylor>Department of Religion>Our Faculty>Faculty>W.H. Bellinger, Jr., Ph.D.
William H. Bellinger, Jr., is known for his research on worship texts in the Old Testament. Much of his work explores the book of Psalms. He has also written on Leviticus and on prophetic texts related to worship. His Psalms: A Guide to Studying the Psalter (2nd ed.) has introduced students in a wide variety of settings to a deeper literary and theological study of this central book in the Hebrew Scriptures. His writings include Psalmody and Prophecy (JSOTSup); Hosea: A Study Guide; A Hermeneutic of Curiosity and Readings of Psalm 61 (SOTI); Leviticus and Numbers (Understanding the Bible Commentary Series); Psalms (With Walter Brueggemann; New Cambridge Bible Commentary); Engaging the Christian Scriptures (With Andrew E. Arterbury and Derek S. Dodson) and The Psalter as Witness (Edited with Dennis R. Tucker, Jr.); and numerous scholarly articles. 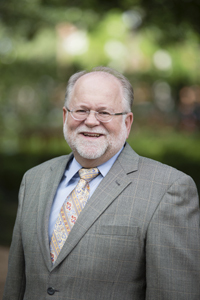 Professor Bellinger has chaired the Steering Committee for the Book of Psalms Section of the Society of Biblical Literature and has served on the Editorial Board of the Catholic Biblical Quarterly. He is also active in the regional professional organizations in the Southwest and in 2008 was named the John G. Gammie Distinguished Scholar by the Southwest Commission on Religious Studies. He has served as Director of Graduate Studies and currently chairs the Baylor Department of Religion. He is also a committed leader at Lake Shore Baptist Church in Waco, a proud husband and parent, an avid sports fan, and a lover of fine music and art. His is currently working on a monograph on the Psalms and a volume on Old Testament Theology. Worship texts in the Old Testament and Old Testament Theology. Young Principal Investigator Award and Grant, University Research Committee, Baylor University, 1986. Junior Scholar Award and Grant, Southwest Commission on Religion Studies, 1988. Centennial Professor Award and Grant, Baylor University, 1989. Robertson Fund Award and Grant, Southern Baptist Education Commission, 1975-1978, 1989. Outstanding Tenured Professor, College of Arts and Sciences, Baylor University, 1996. Outstanding Professor in the Category of Research, Baylor University, 2000. Summer Study Leave and University Research Committee Grant, Baylor University, 1987, 1991, 1993, 1994, 1995. Baylor University Sabbatical, 1989, 1997, 2006. John G. Gammie Distinguished Scholar Award, Southwest Commission on Religious Studies, 2008. Richard Furman Baptist Heritage Award, Furman University, 2008. Cornelia Marschall Smith Professor of the Year Award, Baylor University, 2013. 1984 - "The Interpretation of Psalm 11," Evangelical Quarterly 56, pp. 95-101. 1984 - "`Let the Words of My Mouth. . .': Proclaiming the Psalms," Southwestern Journal of Theology 27, pp. 17-24. 1986 - "Psalms of the Falsely Accused: A Reassessment," Society of Biblical Literature Seminar Papers 25, pp. 463-469. 1988 - "The Old Testament: A Source Book for Christian Ethics,"Understanding Christian Ethics: An Interpretive Approach, Ed. William M. Tillman, Jr. Nashville: Broadman, pp. 35-58. 1990 - "The Psalms and Acts: Reading and Rereading," With Steadfast Purpose: Essays on Acts in Honor of Henry Jackson Flanders, Jr., Ed. Naymond H. Keathley. Waco, TX: Baylor University Press, pp. 127-144. 1990 - "Maker of Heaven and Earth: The Old Testament and Creation Theology," Southwestern Journal of Theology 32, pp. 27-35. 1993 - "Psalm 26: A Test of Method," Vetus Testamentum 43, pp. 452-461. 1993 - "How Shall We Read the Bible? The Case of Psalm 61," Perspectives in Religious Studies 20, pp. 5-17. 1998 - "Leviticus and Ambiguity," Perspectives in Religious Studies 25, pp. 217-225. 1999 - "Enabling Silent Lips to Speak: Literary Criticism in the Service of Old Testament Interpretation," In Search of True Wisdom: Essays in Old Testament Interpretation in Honour of Ronald E. Clements, Ed. Edward Ball (Journal for the Study of the Old Testament Supplement Series 300). Sheffield: Sheffield Academic Press, pp. 53-69. 2000 - "Psalm 61: A Rhetorical Analysis," Perspectives in Religious Studies 26, pp. 379-388. 2000 - "Portraits of Faith: The Scope of Theology in the Psalms," An Introduction to Wisdom Literature and the Psalms: Festschrift Marvin E. Tate, Ed. H. Wayne Ballard, Jr. and W. Dennis Tucker, Jr. Macon, GA: Mercer University Press, pp. 111-128. 2001 - "The Psalms as a Place to Begin for Old Testament Theology," Psalms and Practice: Worship, Virtue, and Authority, Ed. Stephen Breck Reid. Collegeville, MN: Liturgical Press, pp. 28-39. 2004 - "The Hebrew Scriptures and Theology: Resources and Problems," Perspectives in Religious Studies 31, pp. 123-133. 2005 - "Returning to the Hospitality of the Lord: A Reconsideration of Psalm 23:5-6." Written with Andrew E. Arterbury, Biblica 86, pp. 387-395. 2006 - "Psalm 137: Memory and Poetry," Horizons in Biblical Theology 27, pp. 5-20. 2006 - "Psalm 102: Lament and Theology in an Exilic Setting," How Lovely Are the Words, ed. David Howard and Robert Foster (Library of Hebrew Bible/Old Testament Studies). Edinburgh: T. & T. Clark, in press. 2007 - "A Shape for Old Testament Theology: A Lost Cause?" Perspectives in Religious Studies 34, pp. 287-295. 2007 - "Reading from the Beginning (Again): The Shape of Book I of the Psalter," Diachronic and Synchronic. Reading the Book of Psalms in Real Time: Proceedings of the Baylor Symposium on the Book of Psalms, Ed. Joel S. Burnett, W. H. Bellinger, Jr., and W. Dennis Tucker, Jr. (Library of Hebrew Bible/Old Testament Studies 488). New York: T. & T. Clark, pp. 114-126. 2008 “Psalm 102: Lament and Theology in an Exilic Setting,” My Words Are Lovely: Studies in the Rhetoric of the Psalms, ed. Robert L. Foster and David M. Howard (Library of Hebrew Bible/Old Testament Studies). New York: T. & T. Clark, pp. 147-155. 2010 “The Psalter as Theodicy Writ Large,” Conflict and Convergence: Jewish and Christian Approaches to the Psalms, Oxford. 2012 “The Psalter as Theodicy Writ Large,” Jewish and Christian Approaches to the Psalms: Conflict and Convergence. Oxford: Oxford University Press. 2015 “The Psalms, Covenant, and the Persian Period,” Covenant in the Persian Period: Genesis to Chronicles. Winona Lake, IN: Eisenbrauns. 1984 Psalmody and Prophecy (Journal for the Study of the Old Testament Supplement Series 27). Sheffield: JSOT Press. 1990 Psalms: Reading and Studying the Book of Praises. Peabody, MA: Hendrickson Publishers. 1993 Hosea: A Study Guide. Macon, GA: Smyth & Helwys. 1995 A Hermeneutic of Curiosity and Readings of Psalm 61 (Studies in Old Testament Interpretation 1). Macon, GA: Mercer University Press. 1998 The Testimony of Poets and Sages (All the Bible Series). Macon, GA: Smyth & Helwys. 1998 Jesus and the Suffering Servant: Isaiah 53 and Christian Origins. (Edited with William R. Farmer). Philadelphia: Trinity Press International. 2001 Leviticus and Numbers (New International Biblical Commentary, Old Testament Series). Peabody, MA: Hendrickson Publishers. 2007 Diachronic and Synchronic. Reading the Book of Psalms in Real Time: Proceedings of the Baylor Symposium on the Book of Psalms. (Library of Hebrew Bible/Old Testament Studies 488; Edited with Joel S. Burnett and W. Dennis Tucker, Jr.). New York: T. & T. Clark. 2009 Jesus and the Suffering Servant: Isaiah 53 and Christian Origins. (Edited with William R. Farmer). Eugene, OR: Wipf & Stock (Reprint). 2012 Psalms: A Guide to Studying the Psalter, 2nd ed., Grand Rapids: Baker Academic. 2013 Psalms (New Cambridge Bible Commentary; with Walter Brueggemann). Cambridge: University Press. 2014 Engaging the Christian Scriptures (With Andrew E. Arterbury and Derek Dodson). Grand Rapids: Baker Academic.